Amber addressing the Mayor of Miami during the coalition meeting last week. Cities from across the U.S. convened in Miami last week for the bi-annual Cities for Financial Empowerment (CFE) Coalition Forum. The CFE Coalition is a group of city governments committed to supporting the financial capability of their residents through innovative programs and local policy. Forums bring coalition members together to share new ideas and learn from each other’s experiences. Amber Paxton’s selection as co-chair is indicative of the strength and success of the City of Lansing’s Office of Financial Empowerment, which was created in 2013 as part of Mayor Bernero’s commitment to ensuring all Lansing residents have the opportunity to take advantage of economic development happening in the city. As Director of the Office of Financial Empowerment, Amber oversees programs that help Lansing residents to access free financial counseling, affordable banking and savings tools and consumer protections. I caught up with Amber to congratulate her on her new leadership role and talk with her about Lansing’s financial empowerment work. 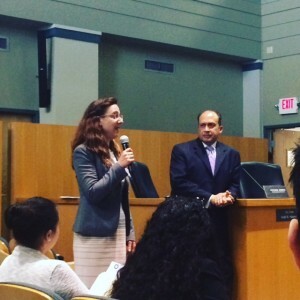 MK: Congratulations on your first CFE Coalition Forum as co-chair! Can you tell us about what the coalition does? AP: The CFE Coalition is member-led and all about connecting with other cities engaged in municipal financial empowerment. We get to share our successes, but also get help addressing challenges that pop up when we implement programs in our cities. Because this is a fairly new role for cities to play, the coalition helps connect peers from across the U.S. We also want to spread the financial empowerment message and grow the movement, so we look to invite new members every year. MK: And why was the City of Lansing invited to the coalition? AP: Lansing was invited to join the coalition in 2014, after successfully launching a Financial Empowerment Center and establishing our Office of Financial Empowerment in 2013. I think Lansing is an important city to be represented because we are a lot smaller than the other member cities. Lansing proves that the municipal financial empowerment approach is effective even in cities with smaller populations and smaller budgets than original coalition members, like New York and San Francisco. MK: Has Lansing’s financial empowerment work grown since you launched your Financial Empowerment Center? AP: Most definitely! After launching the Financial Empowerment Center we decided to take a look across the life course and target programs to our children and young adults. The Financial Empowerment Center serves adults in our community with free financial counseling. We wanted to find a way to start earlier with conversations around saving and good financial habits. In January 2015 we launched Lansing SAVE, which enrolls all kindergarten students in the Lansing School District in seeded college savings accounts. The accounts are provided by Michigan State University Federal Credit Union, who also comes into the classrooms to teach financial education. Now we are planning a program to target young adults in the city’s Summer Youth Employment program. We’re going to help them open bank accounts, sign up for direct deposit and plan how to use their first paychecks. MK: And why should cities be involved in this work? AP: At the City of Lansing, we strongly believe that financial empowerment should be considered a public service. It’s not enough that we just provide emergency services and other supports to stem families’ financial crises. While these programs are extremely important, we also owe it to our residents to help them do better in the future. Financial counseling and other financial empowerment programs help families target the root causes of their financial instability. After working with us to deal with debt, increase their credit, access affordable financial services and start to save for emergencies, Lansing families can take control of their financial lives. MK: Thanks so much for chatting with me! The Michigan Communities for Financial Empowerment is a program of CEDAM. To learn more about the work described in this blog post, check out mcfe.cedamichigan.org or contact Megan Kursik at kursik@cedamichigan.org.